I found your music about one year ago and I've been looking for parodies like these for a long time. I'm so so glad I found you guys. I love your music. I have a lot of your music, I don't listen to anything but. What I really like is that you guys take music from 60s to contemporary and transform the lyrics for God's Glory and I love that. Please don't stop making this music. Thank you guys so much for what you all do. 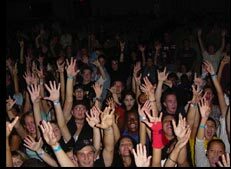 I was in the Soldotna crowd with my pregnant wife (at the ApX concert December 29, 2005). You guys were great then and now my 11-year-old is infatuated with your music. God bless you one and all. I have an annual musing/dream about hosting you and 100 Portraits back here for a music fest. Perhaps someday I will more than dream. Thank you both for the encouragement! We love Washington and Alaska. Beautiful states you've got there, boys!